Our school has a long history, which began with the arrival of William Bramley, his wife and their seven children in 1859. A short time after his arrival William was appointed master of Kaeo Public School under the Board of Education. The original school was built up County Gully Road in 1877 and had an average daily attendance of fifteen pupils. Some year’s later, due to the cold and wet nature of the original site, the school was moved to where our school stands today. At the time, there were many schools in the area, which can be read about in “And So We Grew, Nga Kura O Whangaroa”, a celebration of one hundred, twenty five years of schooling in Whangaroa. 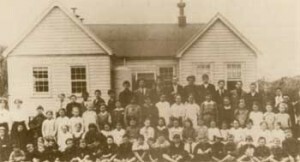 As time passed however, many of these smaller schools closed and Kaeo Public School grew until in 1941 it became Kaeo District High School, catering for children between the ages of five and sixteen. In 1969, following a recommendation from the Commission on Education, Whangaroa College was established as a Year 7 to Thirteen school and Kaeo School became a separate unit. Today we have six/seven classes and a roll that hovers between one hundred and twenty and one hundred and sixty. We have come a long way since those early days of education in Whangaroa.